My husband collects covers, or envelopes, including some First Day Covers/. Here are some of the Frog Covers he picked up for me. You can click on the thumbnails for a larger version of the pictures. 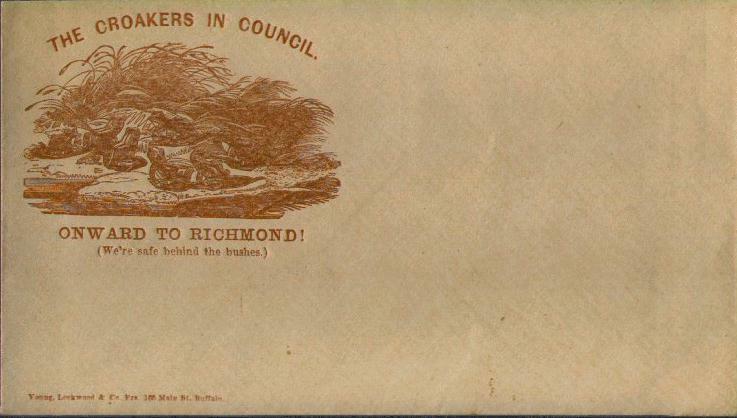 This cover says, "The Croakers in Council. Onward to Richmond! (We're safe behind the bushes.)" "This World Wildlife First Day Cover pays tribute to the green marsh frog - an amphibious creature capable of spectacular leaps covering distances up to 20 times the length of its own body. 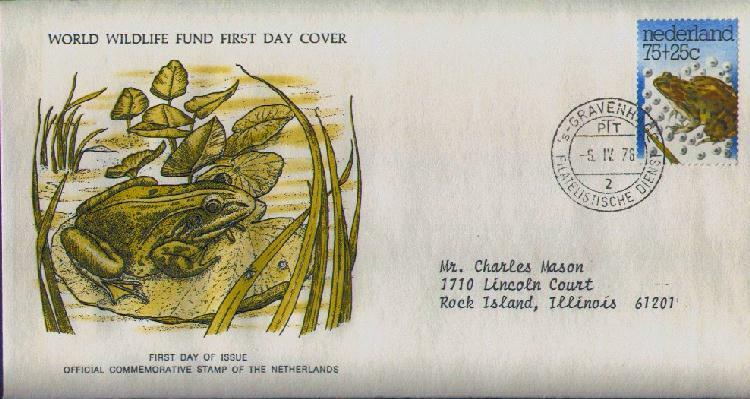 "The unusual 75 + 25-cent postage stamp depicts a green marsh frog with its eggs and is the first semipostal issues in this series. The 25-cent surcharge for this stamp helps to support the World Wildlife Fund in its endeavor to protect the endangered species of the world from extinction. Issued by the Netherlands, the stamp was postmarked in Gravenhage on its First Day of Issue. The cover bears a colorful engraving portraying the green marsh frog on a lily pad patiently watching a nearby insect. "Four to six inches in length, the green marsh frog has big bulging eyes, extremely long hind legs and is a drab olive-brown color. A sound almost like human laughter is a signal that the big green frog is close by. "The frogs spawn in the spring, and within four to fifteen days, tiny fish-like creatures called tadpoles hatch from the eggs. Gradually the tadpole grows larger, developing legs and lungs. The metamorphosis is complete when a young frog emerges to take its place among the lilypads - a process that could take up to two years. In the meantime, many eggs, tadpoles and young frogs become the victims of natural enemies, and few grow to maturity. "Insects, minnows, earthworms and spiders are the green frog's primary food. It feeds under water as well as on land. The amphibious creature uses its long sticky tongue to capture its small prey. Although frogs help the environment by eating tiny pests, humans are among this creature's worst enemies. Green marsh frogs were killed both for food and for use in laboratory research. As a result, they have become an endangered species in Europe and are now under protection." "The whistling frog (Eleutherodactylus johnstonei), honored by this World Wildlife Fund First day Cover, can usually be found in shrubs or small trees. 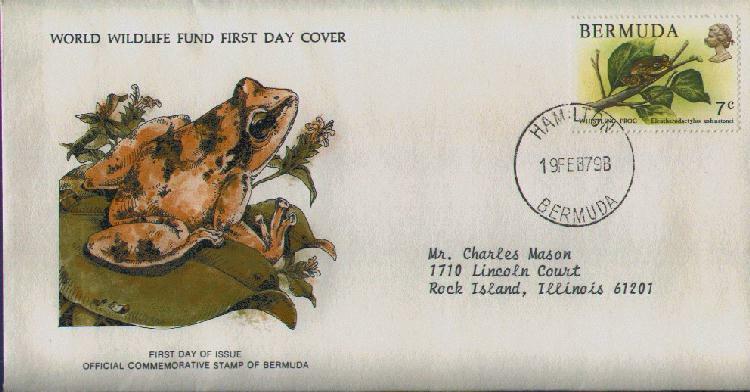 Issued by Bermuda where this cover was postmarked with the first day of issue cancellation, the stamp depicts this interesting creature perched on a tree limb. The original cover design shows how the whistling frog's toes have become adapted for tree climbing. On their tips are discs or pads which permit the frog to cling securely to tree trunks and branches. And the frog's toes are not webbed, another adaptation resulting from life out of the water. "The whistling frog is a member of the genus Eletherodactylus, which includes many species that lay their eggs out of the water. This has given rise to unusual adaptations which help the young survive to become adults. For example, some species lay eggs with enough yolk material to permit the young to pass through the tadpole stage inside the egg itself. Thus when the eggs hatch, the young appear as miniature versions of the adult frog. Other species, which inhabit wet jungle climates, lay their eggs on leaves suspended over the water. The frogs curl the leaves over the eggs and seal their edges with a sticky substance to form a protective cacoon. Since the ends of the leaves are open, the tadpoles fall into the water after they have hatched, where they continye their metamorphosis into adulthood. "One of the most interesting characteristics shared by many species of frogs is their habit of responding to one another's calls. Thus, if one frog begins to croak, he will soon be joined by dozens of others in a frog "chorus." The frogs usually begin to call at dusk, and anyone who can imitate their call can get them started. In fact, frogs kept in laboratories have even been known to start their chorus at the sould of a typewriter." This cover is advertising the "Wm. 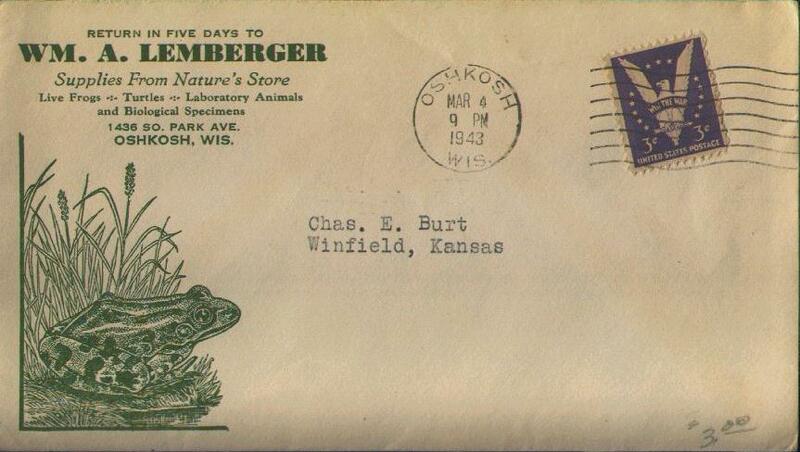 A. Lemberger Supplies from Nature's Store" from Oshkosh, Wisconsin. It features "Live Frogs, Turtles, Laboratory Animals and Biological Specimens." It was mailed from Oshkosh on March 4, 1943. 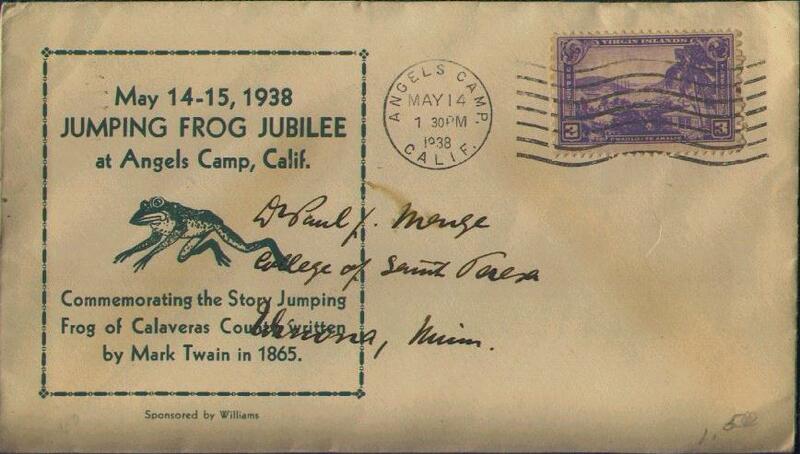 This cover advertises the "May 14-15, 1938 Jumping Frog Jubilee at Angels Camp, Calif. Commemorating the Story Jumping Frog of Calaveras County written by Mark Twain in 1865." It was mailed from Angels Camp, California on May 14, 1938. I hope you enjoy my Frog Page and learn something of interest to you. If you have any comments, please send them to my address below. Page last updated 01 Apr 2005.